Rohith Vemula arose as an icon of civil disobedience against discrimination, injustice, and hatred. The relatively recent news of a PhD student Rohith Vemula committing suicide has galvanized protests across India. Of the many protests emerging in public universities across India in recent weeks, the one held on February 23 — where thousands of students marched through central Delhi demanding “Justice for Rohith” — was probably one of the biggest and palpably indignant. The 26-year-old PhD student at the University of Hyderabad in southern India hung himself from the ceiling fan in a friend’s hostel room. Vemula was a member of the Ambedkar Students’ Association, which fights for the rights of Dalit students on college campuses. He was also one of five Dalit students suspended for an alleged attack on a member of the Akhil Bharatiya Vidyarthi Parishad (ABVP) — the student wing of India’s ruling Bharatiya Janata Party. The students were cleared of all charges by the university in an initial investigation but the decision was reversed in December last year. Vemula was brought up by his single working mother, who is from a “scheduled caste,” the lowest rung of India’s caste hierarchical system. Dalits, known also as the “untouchables,” have done the dirtiest manual jobs in India for centuries. They sweep trash and clean overflowing sewage from roadsides to make ends meet. In the worst cases, they even collect accumulated human waste from latrines. Despite the efforts undertaken to help scheduled caste members, Dalit students face severe poverty. Very few manage to break out of the poverty cycle and the caste they are born into. Many Dalit students face ostracism in colleges and lead segregated lives. Even after graduating with degrees, they are confronted with outright discrimination in the job market and face difficulties climbing the career ladder in modern India. Dalit, a term synonymous with “crushed,” refers to the oppression, often violent, suffered by scheduled castes for centuries in the world’s largest democracy. Vemula was a bright student who even received a scholarship to a prestigious graduate science program. More importantly, he was vocal on pressing for the rights of marginalized and discriminated communities, especially India’s scheduled castes. Although he did not blame anyone for his death, the contents of his suicide note implied that he was unhappy over the discrimination he and other Dalits faced. Many Dalit students face the brunt of discrimination not only because of the caste they are born into, but also for actively organizing and pushing for movements to support their cause. Vemula was the leader of the Ambedkar Students Association, which openly discussed a range of controversial issues such as capital punishment, Kashmir’s thorny relationship with the Indian union, and communal violence against minorities. Vemula was known for being proactive in politics and assertive in pushing his ideas and causes. Students like Vemula are not only from the scheduled castes, but they refuse to be victimized for being born in the lowest rung of the deeply entrenched caste system. The Indian caste system, commonly known as a system of stratification, allows members of “higher” castes to have a greater social and economic status than those of “lower” castes. The system may be known worldwide, but not many denounce it the way critics reviled South Africa’s Apartheid system. “Unfortunately the Indian government, made up of the upper castes, has successfully convinced the international community that caste discrimination is an internal, cultural issue. But the truth is, it affects the very way this country is run,” Dr. Vinod Sonkar from Delhi University was quoted as telling the BBC. 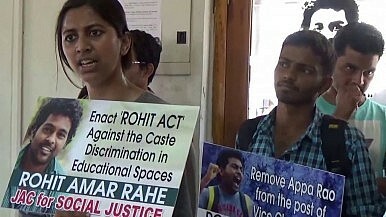 The Mandal Commission, established in 1979 to address caste discrimination, gave India’s scheduled castes equal opportunity for government jobs and academic slots in public universities. The country reserved about 23 percent of government jobs and seats for Dalits and other disadvantaged castes. Today, the reservations apply to many more groups and cover about 50 percent of such posts and seats. However, India’s experiment with the reservation system has seen many socio-economic repercussions. Groups that have traditionally have been better off and in the top levels of the caste hierarchy are demanding their own reservations. They are calling themselves “victims” in order to claim special status and protection. Castes such as the Jats in Haryana, Patels in Gujarat, Marathas in Maharashtra, and Kapus in Andhra Pradesh have orchestrated protests demanding reservations in government jobs and public universities, despite being wealthy or owning land. Vemula had also gained admission to the University of Hyderabad in the nonreserved category, which would have made him the target of double discrimination. Today it is clear that even the reservations of the Mandal reforms have failed to achieve a genuinely equal society. Caste-based discrimination and violence still persists all over India. Earlier this month, a Dalit man was murdered in the state of Tamil Nadu allegedly for marrying a woman from a higher caste. Numerical improvement has failed to make Indian society equal. Lingering inequality is precisely why Vemula’s suicide has touched a nerve in Indian society.